Child-friendly?Extraordinary Measures is based on the true story of a father who sets out to find a cure for a deadly genetic disease affecting two of his children. The movie contains a mature theme and contains scenes depicting very sick kids and grief-stricken parents. In addition, some strong language is used throughout. Even though Extraordinary Measures is rated PG, the subject matter is too mature for tweens and younger teenagers. It is recommended for kids aged 15 and older. Extraordinary Measures is the story of a successful father, John Crowley, in a desperate search to find a cure for Pompe disease, a rare, incurable form of muscular dystrophy, that his two youngest children have. He contacts an ill-tempered research scientist, Dr. Robert Stonehill, and the two men team up by forming a bio-tech company focused on developing a life-saving drug for the two Crowley children. Time is of the essence, however, since Crowley’s daughter is 8 years old and the average life expectancy for someone with Pompe disease is just nine years. The cast includes Brendan Fraser and Keri Russell as John and Aileen Crowley as well as Harrison Ford as the curmudgeonly Dr. Stonehill. The movie is directed by Tom Vaughn and is based on a true story and book by Pulitzer-Prize winning author Geeta Anand. 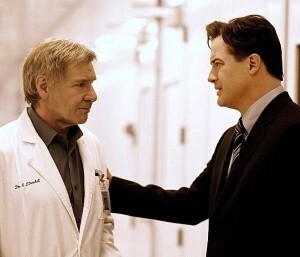 While the subject matter of Extraordinary Measures may be hard for both parents and kids to deal with, the movie tells the story of an unlikely alliance between a father trying to save his kids and a scientist trying to prove himself and his theories as well as the mutual respect the two come to gain for each other. The movie’s outcome is predictable, but the message of taking risks and fighting for your loved ones provide it with a positive message that fathers can use in discussions with their children.